The Hottenstein family is descended from German nobility. The family traces its origins to Riebold von Hottenstein near Asschaffenburg, Germany in 380 A.D. Jacob Hottenstein was born on February 18, 1697 in Esslingen, Germany. Jacob Hottenstein was the original owner of the property and was a German immigrant who settled in Oley Township in 1727. Later, he would move into Maxatawny Township. He was married to a Maria Dorothea Reber and was buried in the family cemetery on the property when he died in 1753. They were members of the local Reformed congregation. The children of Jacob and Maria were Jacob, Dorothea, Maria Catherine, William, David, and Henry. Jacob Hottenstein’s 1753 will stated, in addition to sons David and Henry inheriting the land, that David received a stallion and that his widow, Maria, would be allowed to remain on the property in either of two stove rooms (this is a hint at the earlier structure at this property). The will also left the following yearly bequeathment to Maria unless she remarried: 20 bushels of wheat, 100 weight of pork, 50 weight of beef, 2 Pounds in money, 20 pounds weight of clean flax, as much firewood as necessary, 1 hogshead of cider, the grazing of a cow, and the pacing of a mare. Henry Hottenstein was working as a physician in Lancaster County at the time of his father’s death. David Hottenstein was born in 1734 and lived until 1802. David married a Sarah Herbein and their children were Jacob, David, Daniel, Catherine, and Dorothea. I believe this David Hottenstein is the one that served as a lieutenant in Captain Henry Haller’s Regiment during the battles for Long Island in the American Revolution. David and Sarah’s son David is the one that built the house. David Hottenstein (the second) and his wife, Catherine, had six children. David and Catherine’s son David was the first in a long line of doctors in the family. 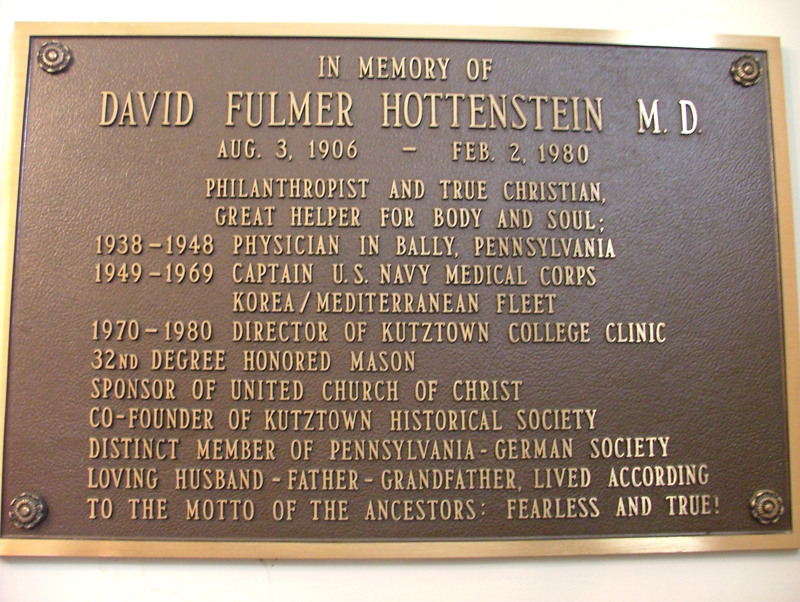 Dr. David Hottenstein attended the Medical Institute in Philadelphia, practiced medicine in Berks County, was married to an Elizabeth Kline, and died at age 82 in 1848. David and Elizabeth’s children were David, Jacob, Daniel, William, Isaac, Henry, Catherine, and Sarah. This David was a brigadier general during the War of 1812. There is some thought that the fact the Hottensteins were pumping such a great deal of money into their architectural wealth—unusual for Pennsylvania Germans—attests to the fact the family was becoming assimilated into the American culture. It appears, toward the end of his life, the David Hottenstein which built the house was the principle tax payer in Maxatawny Township. There is some theory that David served in the Continental Army on Long Island but there is no documentation for this. A number of the Hottensteins were instrumental in founding what eventually became Kutztown University. Many of them even sat on the Board of Trustees over the years. Many are known to have studied medicine and dentistry at Ursinus College. It is believed that one Edward Hottenstein operated his dentistry practice out of the adjacent doctor’s office on the property. The last David Hottenstein to live in the home had been a captain in the U.S. Navy until he retired in 1969. At one point, David was the head of the naval hospital at Aberdeen, Maryland. Although little hard evidence has been discovered at this time, it is clear that for at least some of its history this house had to be a well-known location to local residents. It appears as though the Hottenstein family was financially powerful and influential in the local community. The fact they helped found Kutztown University attests to this fact. Also, with so many of them being in the medical profession, people would have sought them for advice and medical help. At least some of the Hottenstein men operated their medical practices on the property. Also, the home is located on what was a major artery even in the 18th Century. At the time the home was constructed, Route 222 was known as the Easton Road. 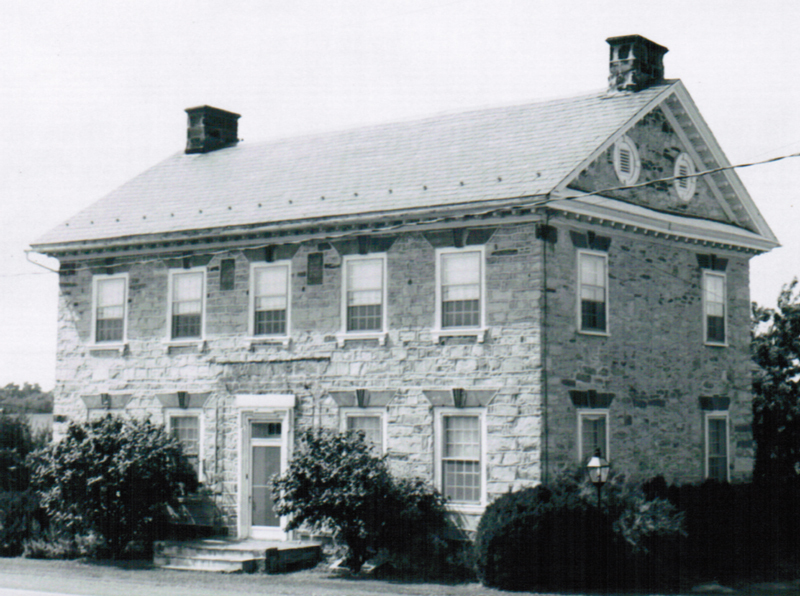 The main house was built in 1783 by David and Catherine Hottenstein. The house is an outstanding example of German style detailing added to a standard Georgian floor plan. 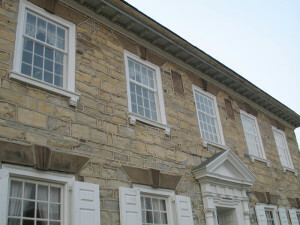 The two and a half story building is made of limestone with dressed stone on the principle façade and rubble stone on the three remaining sides. The cornice and eaves of the original block consist of crown mold, fascia, modillioned soffit with Greek key mold between modillions, and bed mold. Each soffit corner has carved sunflowers between modillions. There is a belt course and a water course carved from native sandstone, even though the majority of the structure is made from limestone. Also, there are sandstone lintels with a raised key stone over each window. The unique date stones are also made from carved sandstone. All the exterior openings in the structure are original and unaltered. A number of shutters which appear to be original to the structure are currently stored in the attic of the summer kitchen. The house is completely unique to the area for its style, workmanship, and detail. The interior features original mantles and paneling, corner cupboards, and hand-wrought hardware. The central hall of the interior is elaborately decorated with pilasters, pediments, fluting, and crown molding among other things. Most of the original woodwork is intact with some original paint including stippling and graining. The door between the current kitchen and the dining room is not original (the frame of this opening dates from between 1840-1860). The original stair to the basement would have been a winding stair. The wood work and detailing from the current kitchen has been completely gutted—some of this work was moved to the large second floor bedroom. All of the interior locks are Germanic. Most of the doors in the house are supported by rat-tail pintles. The attic door is hung on “ram’s horn” hinges. These types of features give this Georgian home a Germanic overtone. The asymmetry of the paneling may suggest unfamiliarity with the Georgian aesthetic. The three-room plan on both floors can be interpreted as either a Germanic survival plus central hall plan, or an adaptation of a central hall English Georgian plan. The rear kitchen ell was built around 1847 and supposedly is made from stones from a church that once stood near Bowers Road. The windows and trim of this wing are of the Federal style. There is also a summer kitchen which was attached to the main house by a shed-roofed porch around 1965. The interior of the loft in the summer kitchen is blackened, as though it was used for smoking. At some point a Victorian front porch was added which the Historic Preservation Trust of Berks County has removed. The last David Hottenstein to live in the home installed the modern kitchen in the home. The interior of the largest bedroom was removed by the Sittigs for $1,000 plus $700—which Francis DuPont paid—for repairs (payable to George Grim) to the room in 1950 and is currently known as the Fractur Room at Winterthur near Wilmington, Delaware. The woodwork was sold by family relative George Grim to antique dealers Edgar and Charlotte Sittig who in turn sold it to Henry Francis DuPont for $3,000. Apparently, the process of removing the woodwork met with harassment from local Kutztown residents. As a result, Grim tried to stall the workers and get more money out of DuPont, but failed. Today, in its new location at Winterthur, the room houses a Hottenstein family cask which is painted to mirror the woodwork. Outbuildings include a smokehouse, bake house, root cellar, and a two car garage with a workroom and greenhouse attached. There is a separate building which housed a doctor’s office. Across the street in a farm field is located the Hottenstein family cemetery. Possibly, the large barn across the street was once part of this complex. The survival of this group of buildings at this location gives a glimpse of a late eighteenth century farm layout which is becoming rarer each day in Berks County. The original farm that Jacob Hottenstein owned included 116 acres. Jacob had settled in what would eventually become Maxatawny Township in 1729 after living in Oley Township for a couple of years. After leasing his 116 acres for one year from Caspar Wistar, Jacob bought the land on November 18, 1729 for 40 Pounds. Jacob acquired 50 more acres in 1742, another 176 acres in 1751 and eventually even more to total an additional 327 acres to his land holdings. Prior to 1734, Jacob was paying a quit rent for his land. David Hottenstein inherited half the land from his father Jacob. David acquired the other half of the land by buying out his brother’s (Henry’s) share of the inheritance. On the 1759 tax list, David Hottenstein is listed as paying 23 Pounds. The 1854 Berks County Atlas lists a W. Hottenstein as residing in the house and the 1862 Berks County Atlas lists a David Hottenstein, esq. In 1876, a H.S. Hottenstein was listed as a resident. However, by some time in the early twentieth century, the home was lived in by tenant farmers because the family had moved away. The Hottenstein Mansion was placed on the National Register of Historic Places on June 22, 1972. 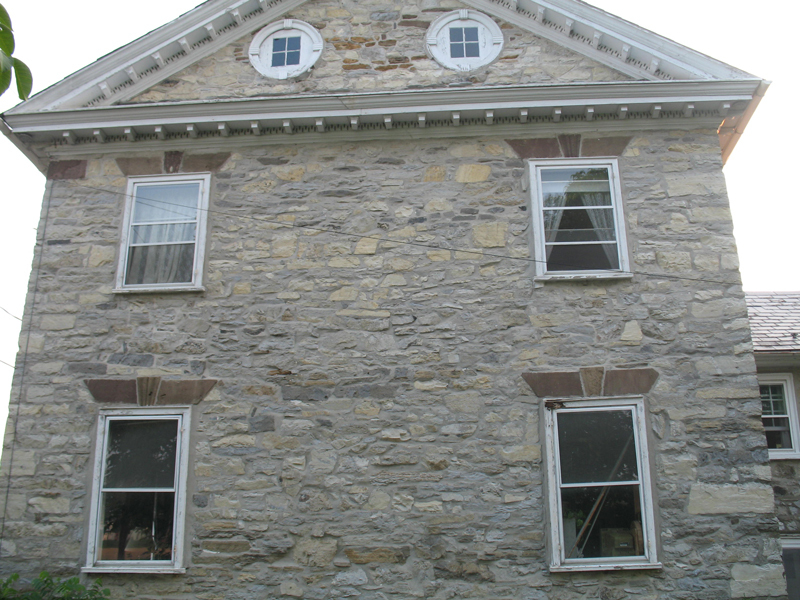 The property remained in the Hottenstein family though until 1976 when the Historic Preservation Trust of Berks County received it as a gift from Dr. David Fulmer Hottenstein. David Fulmer Hottenstein was the last member of the family to live in the home. In 1985, the home was occupied by Mr. and Mrs. John Beard. By 1988, Marilyn Stewart, an art professor at Kutztown University, was living in the house. Currently the home has a resident curator. The Hottenstein House is located along Rt. 222 in Kutztown. The Hottenstein House is tenanted. If you are interested in touring this property, please contact the Trust office. The Historic Preservation Trust does not guarantee the availability of a tour of this property. Please respect the privacy of the tenant by not trespassing on the property. Interested in learning more about the Hottenstein House and the Historic Preservation Trust of Berks County? Search records, pictures, images, architectural drawings and more in our Online Archive.